The water level of the Dead Sea (Israel and Jordan) has been dropping at an increasing rate since the 1960s, exceeding a meter per year during the last decade. This level drop has triggered the formation of sinkholes and widespread land subsidence along the Dead Sea shoreline, resulting in severe economic loss and infrastructural damage. In this study, the spatio-temporal evolution of sinkhole-related subsidence and the effect of human activities and land perturbation on their development are examined through Interferometric Synthetic Aperture Radar (InSAR) measurements and field surveys conducted in Israel during 2012. Interferograms were generated using the COSMO-SkyMed satellite images and a high-resolution (0.5 m/pixel) elevation model obtained from airborne Light Detection and Ranging (LiDAR). Thanks to this unique integration of high-resolution datasets, mm-scale subsidence has been resolved in both undisturbed and human-disturbed environments. A few months long precursory subsidence occurred in all three sinkhole sites reported in this study (e.g. Fig. 1). Migration of subsiding areas and successive sinkholes in specific sites suggest progressive dissolution and widening of the underlying cavities. Certain human activities, such as filling of newly formed sinkholes by gravels or mud injections into nearby drill holes, seem to enhance land subsidence, widen existing sinkholes and even form new ones. Apart from shedding light on the mechanical process, the results of this study may pave the way for the implementation of an operational sinkhole early warning system. Figure 1. 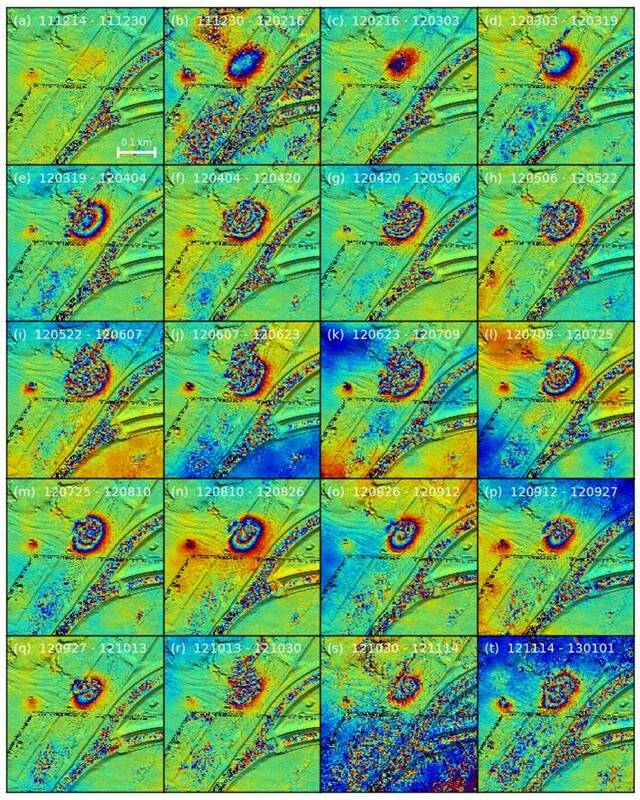 Consecutive COSMO SkyMed wrapped interferograms of #P88 sinkhole site for the period December 2011 to January 2013, with acquisition intervals indicated on each. One color cycle represents half radar wavelength (~1.5 cm) displacement along the satellite line of sight. Note that minor subsidence can already be observed between December 14 and December 30, 2011 (panel a), whereas the first sinkhole in this site collapsed on March 19, 2012 (panel d).